The most welcome warm weather and sunny days of spring also brings forth some undesirable sights. 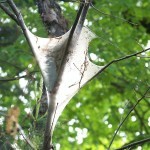 One of the most common is the web of the Eastern tent caterpillar. Found commonly in cherry trees (members of the Prunus family), the prominent web in the fork of the trees provides the nightly hiding place for the caterpillars, which feed on the leaves during the day. Once the insect has had its fill of cherry tree leaves, it will commonly crawl to other nearby trees (e.g, Crabapples and Hawthorn) for feeding. In bad years, this creature can be found on roses, beech, birch, witch hazel, and poplars, to name a few. 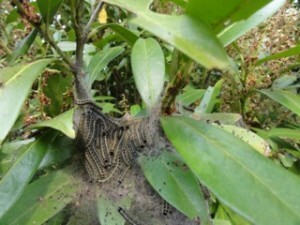 The eggs hatch in early April, producing young black caterpillars, which enlarge and spin silk tents. The eggs hatch in early April, generally when leaves start appearing, producing young black caterpillars, which enlarge and spin silk tents. 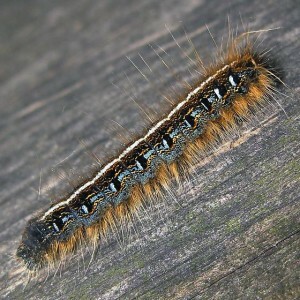 The mature caterpillar is recognizable by a distinct white stripe down the back (usually evident by late May). 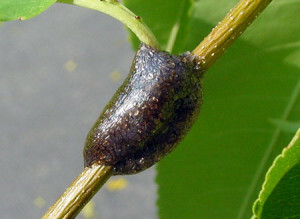 After feeding on the leaves, they leave the tree and spin cocoons from which emerge brown moths in early summer, which mate to produce overwintering eggs. Control: Developing caterpillar tents should be ripped out and destroyed by hand. Any twigs with egg masses found during the dormant season can be pruned out and destroyed. If chemical control is needed, it must be applied to leaves (that caterpillars will eat) in early spring as soon as the silk tents are observed. Bacillus thuringiensis (b.t.) is a natural insecticide harmless to humans and animals, and it is a very effective control. As spring progresses, be on the lookout for Eastern Tent Caterpillars that may have migrated to other plants. The photo of the tent on a Cherry Laurel was found in May last year. While not a common site for this pest, the Cherry Laurel is a member of the Prunus family. To be proactive, in winter or early spring before the tents appear, look out for the egg masses on tree twigs, and prune them off to prevent larvae (caterpillars) from hatching.